Most of us seen the Vitruvian Man from Leonardo Da Vinci but now there is a Vitruvian Doctor. This white t-shirt that comes in a men or women’s version shows a picture of the 12th Doctor Who and he is holding the Tardis in his hand and above and below it there is text above and below him. But it gets interesting when the lights go off because then like the vitruvian man you can see his arms and legs in different locations glowing in the dark. This amazing Doctor Who t-shirt comes in sizes Small – 3XL and will be a hit in the light or the dark. So get your own Doctor Who Vitruvian Doctor Glow In The Dark T-Shirt. This Doctor Who t-shirt is fun and different. On this white t-shirt you can see the 12th Doctor and above him the text “You don’t know me”. Of course people will look at that and think yeah who is that character. But then when it gets dark the t-shirt starts to glow and now in the background you can see all the previous Doctor’s and below all that the text “But you will”. So now you can have a Doctor Who t-shirt that is great in the day and super at night. And you can get this glow in the dark Doctor Who t-shirt in sizes Small – 2XL and it sis made from 100% cotton. Introduce the world to Doctor number 12 with this Doctor Who 12th Doctor Glow In The Dark T-Shirt. Now you can have a Doctor Who t-shirt that will be there for you in the light or darkness. This Doctor Who t-shirt glows in the dark! And on this black t-shirt you can see the Tardis in the back and the Doctor in front of it and he is surrounded by light and stars. This time traveler t-shirt is made from 100% cotton and comes in a men and women’s version in a range of sizes from Small – 2XL. This Doctor Who t-shirt is amazing in many ways, it glows in the dark and the design is amazing. The picture above is not to great so click on it to have closeup look at the design of this t-shirt. 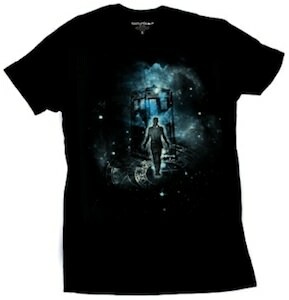 Lets travel in time with our favorite Doctor in this Doctor Who Time Traveler Glow In The Dark T-Shirt.